The K.A.C.C. Military Aviation Fuel Depot in Las Venturas in Grand Theft Auto: San Andreas. This is a screenshot of the emergency services, including the military, from Grand Theft Auto: San Andreas - a copyrighted video game developed and published by Rockstar Games. 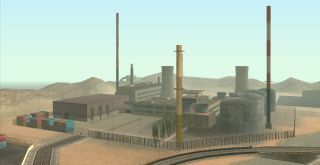 This is a screenshot of Las Venturas from Grand Theft Auto: San Andreas - a copyrighted video game developed and published by Rockstar Games. This page was last modified on 23 March 2014, at 22:18.